Online School Management Software System India - Do you want to buy School Administration Software or free software for Schools? Our School Management ERP Software for Schools, Colleges and known as School Management Software, school management software India, Online School Management Software System, school management software offline, school management software demo, School management software free, School information management system, School software in India. School Management involves School Management System software that automates the life cycle of a student from admission to pass-out, maintains academic records, facilitates collaboration, and allows schools to collect fees, conduct exams and print report cards. 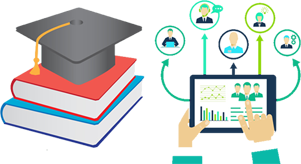 School Management Software is a dynamic platform which allows educational institutions to manage their whole organization through the web, any time from anywhere in the world. It nurtures the interaction between school, teachers, students and parents in a most effective way. School Management Software System is one of the amazing products of Adysoft, a Agra based company, constantly on the bring, for creating new software tools and enhancing the leverage of technology to improve human, business performances and organizational skills. Purchase online College School management software system in Agra, Uttar Pradesh, India where you will manage student records, Teacher records, parents details, Marks sheet, class details, bulk uploading records and more features. School Management System is a large database system which can be used for managing your school's day to day business. SMS allows users to store almost all of their school's information electronically, including information on students, employees, properties, teaching meteorites etc. Most importantly, this information can be easily shared with authorized users, records can be easily searched, and reports can be easily generated. Our fully automated online school software Comprises following modules which makes the management of the institution Very efficient and effortless. School software facilitates the important Functions of school such admission, fee collection, attendance, Timetable, maintains of information about students, teachers as well as non­teaching staff of schools, colleges, academies And institutes an extremely easy and efficient. School Management Software also known as school management software India, Online School Management Software System, school management software offline, school management software demo, School management software free, School information management system, School management software open source and it is simple and easy to understand. Our process and methodologies are persistently monitored, efficient to keep pace with the new innovations in technology and customer's requirements. A person can master this School software in short time with basic computer knowledge. School Management Software, school management software India, Online School Management Software System, school management software offline, school management software demo, School management software free, School information management system..